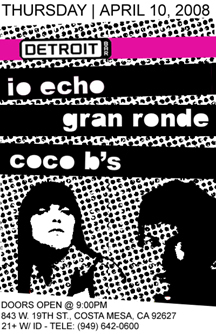 We're playing a show this Thursday, 04/10/08, at Detroit Bar in Costa Mesa with IO Echo and Gran Ronde. We played with Gran Ronde once before at Detroit Bar and they burned the house down. Still trying to figure out how they get their keyboard sounds from an iPod. In the CoCo B's player lately are the new releases by Tokyo Police Club, Foals, Digitalism & MGMT.